This page is dedicated to the Siberian cedar products under brand name �The Ringing Cedars of Russia�. Here you can ask your questions, find your answers and also you can read the reviews from people who already used the Siberian cedar products under "The Ringing Cedars of Russia" brand. supporting the Ringing Cedars movement - Ringing Cedars USA LLC., an authorized distributor of the Ringing Cedars of Russia books and products, adheres to the highest ethical principles of business as expressed in the Ringing Cedars book series. Part of the profits from sales of Ringing Cedars of Russia books and products goes to Anastasia Foundation, the non-profit founded by Vladimir Megre to further the ideas of his life-changing books and provide support to the nascent ecovillage movement. Pine nuts are praised throughout the world as a nutritious healthy snack and essential ingredient in multiple oriental and Mediterranean dishes (check out our Recipes section for incredible culinary suggestions). In fact, pine nuts are so nutritious they have been the staple in diet of many Native American tribes and indigenous people of Siberia (see the nutrition chart below). There are over 20 pine tree species in the world producing pine nuts, of which the pine nuts of Siberian cedar (or Siberian pine, Pinus sibirica) are recognized as the most nutritious and having the greatest medicinal value. 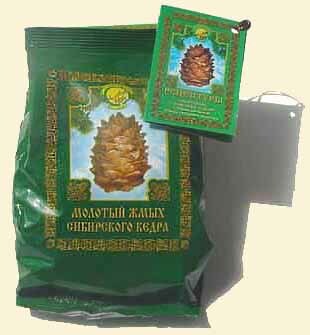 These are the pine nuts that are marketed under "The Ringing Cedars of Russia" brand. We have them both shelled (ready to eat) and in the shell. While extracting these pine nuts is a meditative time-consuming process, the rewards are great as well - freshly shelled pine nuts have some volatile essential oils (giving them an additional crisp fragrance of pine needles and a unique taste) which evaporate within one hour after the nuts are shelled. 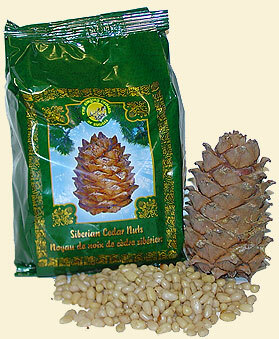 Siberian pine nuts bearing "The Ringing Cedars of Russia" brand are available from ringingcedarsusa.com on-line Store, both shelled and in the shell, and in a variety of packages. They have a shelf life of 6 to 12 months (refrigerated) and may be frozen to extend their shelf life indefinitely. 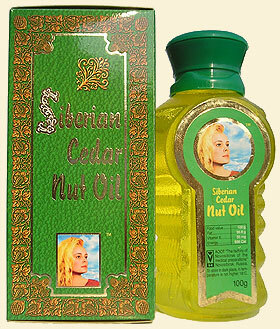 Siberian cedar nuts (pine nuts) contain about 60% oil. They are therefore pressed to obtain cedar nut oil, which is available on the market as a very expensive gourmet cooking oil. Cold pressing in all-wooden presses is preferred to retain the nutritional properties of nuts and derive the oil of highest quality. The cedar nut oil bearing "The Ringing Cedars of Russia" brand comes exclusively from wild-harvested Siberian cedar nuts (Siberian pine nuts) - the most nutritious and medicinally valuable pine nuts in the world. In comparison, other pine nut oils are usually pressed from the Italian pignolia pine nuts, which are not nearly as potent and are often harvested from trees growing in plantations. Our pine nut oil is extra virgin (100% cold pressed from freshly shelled raw pine nuts), whereas most pine nut oils on the market are either not cold pressed or even pressed from roasted (!) pine nuts, which significantly decreases the oil value. Finally, "The Ringing Cedars of Russia" pine nut oil is the only pine nut oil available on the market anywhere in the world pressed with wooden presses in accordance with traditional techniques described in Vladimir Megre's life-changing book "The Ringing Cedars of Russia" (available from our on-line Store). In contrast, all other pine nut oils are pressed using steel presses, which immediately degrades them (contact with steel oxidizes some of the pine nut oil's most important ingredients such as vitamins, and is known to remove the 'life force' from the oil). Check out our Recipes section for incredible culinary suggestions featuring the virgin cold-pressed pine nut oil. Pine nut oil has also traditionally been used to cure a wide array of ailments - ingested (decreasing blood pressure, boosting immune system resistance, etc.) or applied externally (a range of dermatological disorders). Pine nut oil contains pinolenic acid, a polyunsaturated fatty acid, and is marketed in the U.S. as a means to stimulate cell proliferation, prevent hypertension, decrease blood lipid and blood sugar, and inhibit allergic reactions. It is also used in expensive cosmetics. 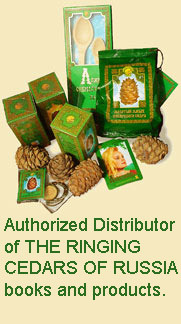 The unique pine nut oil bearing "The Ringing Cedars of Russia" brand is available from ringingcedarsusa.com on-line Store. It has a shelf life of 12 months (refrigerated). The tasty 'byproduct' of pine nut oil pressing is pine nut meal or flour, which has a wide variety of culinary uses. It is a gourmet substitute for wheat or rye flour, used in pastries, pancakes, etc. giving them a rich nutty flavor. Mixed with water, the meal becomes a terrific pine nut milk or pine nut cream - a milk-like drink with sweet, somewhat bitter rich nutty flavor. A great hit in Russia, this product is not yet available in the U.S. Source: USDA National Nutrient Database for Standard Reference, Release 16, 2003.